Why did Schubert not compose more duets for voices and piano? There are only two really worthy of the name: Licht und Liebe and Mignon und der Harfner. The first of these is taken from Matthäus von Collin’s play Der Tod Friedrichs des Streitbaren (1813) where the eponymous hero, Duke Friedrich the Valiant, reflects on past happiness. In the distance he hears first the sound of a man’s voice, then a woman’s voice on its own, and finally the two together. In Licht und Liebe Schubert follows this scenario to the letter, even if it means that the soprano spends the first half of the song silently waiting to sing. The duet setting of Nur wer die Sehnsucht kennt is a faithful reading of Goethe’s intentions in Wilhelm Meister, when the poet informs the reader that Mignon and the Harper sing the song in antiphonal phrases (it is treated as a solo by other composers, as it was by Schubert himself on three earlier occasions). 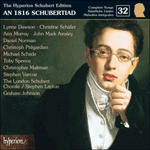 All the other Schubert songs which are sometimes billed as duets are really shared songs on suitably grand (and usually pseudo-historical) subjects: Antigone und Oedip, Hektors Abschied, Hermann und Thesnulda, Cronnan, and so on. In these ballad-type compositions, male and female voices alternate rather than combine. Mention should also be made of a wordless singing exercise with figured-bass (Sing-Übungen D619), written as a duet in 1818 for the two young Esterhazy countesses in Zseliz. It is interesting that the composer needed the specific instructions of the poet as an excuse to cast a song with piano as a duet; how different this is from, for example, Mendelssohn, who seems to have regarded any love poem as suitable for duet setting – ‘ich’ poems, as well as those voiced by the more plausible plural ‘wir’. Mendelssohn was especially fond of combined women’s voices, and the inspiration for this sisterly collaboration goes back to Mozart’s Fiordiligi and Dorabella, although it now seems much more Victorian in effect. Schumann followed Mendelssohn’s example and even took matters one step further: with Spanisches Liederspiel the song cycle for four voices was born, where the lied has a quasi-operatic cast (in both senses) all of its own. Unlike Brahms, who was an enthusiastic composer of vocal chamber-music duets in the Schumann mould, it is interesting that Hugo Wolf, to judge by his output, was even less interested in duet-poetry and -music than Schubert. 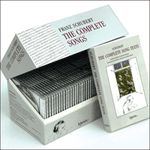 If one remembers the singing exercise for Schubert’s countesses, it may have been that both composers found such works to be lacking in seriousness, the stock-in-trade of singing dilettantes who needed someone else to bolster their mediocre voices. There was certainly a lot of rubbish written for two voices, excruciating comic songs especially, and the flavour of drawing-room performance by ungifted amateurs has long lingered over the medium. Another possibility is that the singing of duets seemed too operatic and stagy to Schubert, and that he, like Wolf, preferred to keep the two forms separate. This is despite the fact that in some of the earlier songs the two forms seem closely to resemble each other. 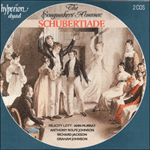 Schubert’s long ballads are effectively opera-in-the-home, too difficult to stage anywhere but in the imagination, and thus nearer to the wonders of film than the conventions of the theatre. The song is in G major and is not especially daring harmonically. When ‘In den weiten’ is followed by the falling sequence ‘blauen Fernen’, and when ‘Strebt das Herz nach Liebeswonne’ is repeated in a higher tessitura, we realize with gratitude that this composer is able to take the operatic commonplaces of serenades of this kind and turn the base metal of sentimentality into the gold of real feeling. For the second verse the music modulates (in a manner that suggests the entrance of a new character, or at least the turning on of another spotlight) from G major into E major. The accompaniment throbs in gentle syncopations supporting a noble, but rather less inspired, vocal line for the soprano. The purpose of this is to act as a foil to the big tune of the opening which will reappear at the recapitulation. E major cedes to E minor, and from ‘Wehe mir, wie so trübe’ the voluptuous, if rather static, melody is replaced by quasi-recitative underpinned by harmonies falling in bass-line semitones to find temporary quietus in C major. As the vocal line is caught and pinned on a murmured B natural (at ‘Nun vereinsamt, ohne Liebe’) something wonderful happens in the accompaniment which is suddenly gently animated by semiquavers cradling this fixed note and passing it back and forth between E minor and B major, and thence to B minor. This is a picturesque pathway back to the home key of G major. This modulation coincides with the inevitable reappearance of ‘Liebe ist ein süsses Licht’ where the tenor’s return is almost surreptitiously accomplished with the gentle change back into the home key; it is a most artfully prepared and winning moment. After this, the two voices dovetail in lambent rapture where passion is moderated by moonlight and memory, the two voices echoing each other at first, and then joining forces in euphonious thirds and sixths. At the end of this intimate conversation, the piano’s semiquavers are stilled for a final section (repeats of ‘Liebe ist ein süsses Licht’) which is very much part of the musical structure but which somehow suggests the freedom and release of a joint bel canto cadenza for two singers, no matter how strictly the music has been notated. Performers have been known to make a meal of this with much slowing down in unashamed operatic, curtain-taking, spirit. But the music works better when followed to the letter – and the feeling of a quasi-operatic peroration is built into the music without the performers needing to add to it. The accompanimental details in these final twelve bars are very telling, particularly the cello-like fragment of melody which is presented, in the bass clef, in counterpoint to the final ‘ein süsses Licht’. At moments like this one can easily imagine that this beautiful nocturne had been somehow orchestrated in the composer’s mind, just in case Collin (a distinguished dramatist who was later to be one of Schubert’s important patrons) should ever want to use it in the theatre. It should be said that the dating of this work is contested. In the absence of a manuscript, John Reed believes that the piece was written much later than 1816; he places it with the other Collin songs in 1822 or 1823. Although it is a tidy idea to place all the Collin settings in the same period, there is, as Otto Erich Deutsch also thought, something about Licht und Liebe which suggests the younger, rather than the fully mature, Schubert. It is true that the magical world of Collin’s Nacht und Träume is prophesied by that high-lying vocal line and those oscillating accompanying semiquavers, but this duet, delightful as it is, is not in the same exalted class as that masterpiece. Liebe ist ein süsses Licht. Denn sie ist ein süsses Licht. Love is a sweet light. for love is a sweet light. now I am abandoned, unloved.